Win a $15 GC to Borders! Another quick giveaway! I've been holding on to this for some time, until I was ready to give it away! Now it can be your Mother's Day Gift from me! *Please note, this item will not arrive in time for Mother's Day, but should arrive by the end of next week! Want it? Leave a comment here by midnight EST 5/11/09 and you could be the lucky recipient! For extra entries, spread the word. Twitter, Facebook, Ning... you name it. Leave a comment for each extra entry. Great giveaway. I've been dying to buy my mom a mother of the bride book. Would love to win a chance at adding books to my collection. Who doesn't love books? LOL Have a great day. What a great giveaway! Thanks so much ! Hope you have a Happy mother's day! WOW! What a awesome giveaway! Thanks! I could get a couple of great books with this if I won. Thanks. Great giveaway. I would love to get a good book. This is a great giveaway, I would love to get a book for me! Thanks, i would love to win! I spread the word by putting it on my blog! I'd love to have this! If I could live in a bookstore, I think I would! I cannot live without books ...and you don't want me to die, right? I am an avid reader! I would love to win this for Mother's Day and my birthday (5/11)! This would be great to get books for my mom or kids with it. I love Borders - all those great books - so many choices. I could literally spend days there! Please enter me. I looove bookstores. I'd love to gift this to my mother in law as a late mother's day surprise! Will be starting back to school soon -this would come in handy! I just spent a small fortune there the other day! I would love to go shopping again! I need the latest Sherrilyn Kenyon book so this would be great! I think it is lovely that even people across the border can win a Border's (card). Thank you! I would love a new book and coffee drink for myself! I would love to be able to give this to my dear friend of mine who just adores Borders..this would be perfect for her! 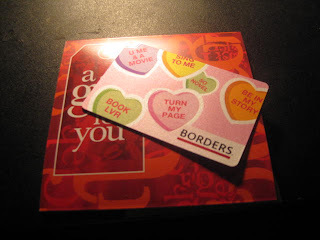 What an excellent giveaway as well..gift card to use for Borders..doesn't get any better! Thanks! I've never purchased anything from Borders, so thanks for this giveaway! I too, like you live frugally and enter sweeps! Could always use a new book for mom. I am always at the book store, this would be put to good use. I love to buy books for my Mom. Thanks! Great prize, I love online shopping. Thanks for the chance! I love to read and really want the new Charlaine Harris book. Thanks! I have been wanting to buy a new self help read. This would be perfect to fund it. Please include me. I have a whole wishlist it could be used on. My husband, daughter, and I love to hang out at Borders. This would be a nice treat. I love Borders ... the smell of new books, people milling about quietly, all the wonderful choices just waiting for me. I can easily spend a few hours there alone. I love their stationary section! They have the cutest stuff! I also love that they will order ANY book for me! Great giveaway! Borders is my favorite bookstore!! My kids love to go there. Thanks. I love bookstores, this would be a great Mommy's day gift for me! Relaxing day of coffee and reading! I'd love to pick up some new board books for my daughters - my son has tons but can't part with them! We love books here :). Thanks for this great giveaway! Borders is one of my favorite stores. i would so love to go buy a new book for MYSELF! I would love to win this to give to my husband. Borders is my husband's favorite store. "Borders" is the place to be to let my mind wander and discover...without borders!! Happy Mother's Day today and always! My mother would love this. She'd spend it on books about the medival ages. How fun! I'd super love to win this! Count me in. My family reads a lot! I love borders. And I would put this card to good use. woww awesome I would love to gift the car to my mother-in-law...she is just like my own mom..
Wow! That's a super giveaway....I would love to win this. I would love to win this! I could use it for me, but most likely would use it for my son...he is really into the Magic Treehouse books right now. I love Borders. This is very generous of you! Love reading. Thanks for the giveaway!